I bike a lot in San Francisco. This means I need quality lights on my bike. 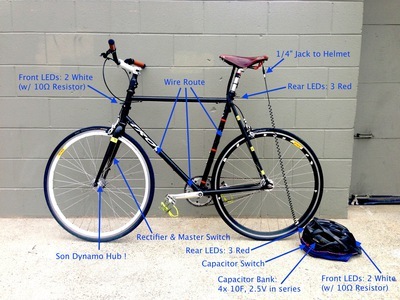 But I have a couple problems: 1, I'm lazy and terrible at charging up even the most convenient of recharchable batteries or lights, which means I'm inevitably biking around at night with feeble little worn-out lights, and 2, I dislike removing lights from my bike while it's parked on the street. I've rigged up high-intensity Luxeon Rebel LEDs right on the frame of the bike (and nestled in the crevices of the helmet), and power them with a dynamo hub: No Batteries ! I knew I would be spending a bunch of time on the project, so I went with a top-of-the-line dynamo hub, the SON deluxe. The SON was about $300 just for the hub, and has worked great. But you can get an entire front wheel built around a hub for about $180, and it would probably work well also. Phase 1: wiring & LEDs. 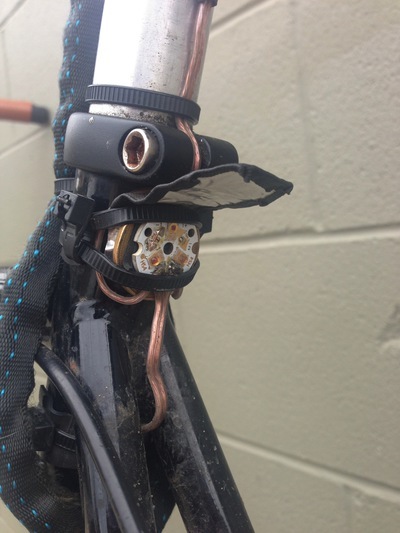 I ran speaker-wire from the hub up the forks, across the headset, along the down-tube, under the bottom-bracket, and up the seat-tube. I put a set of white Luxeon Rebel LEDs (with "coolbase" mounting) on the headset, and a red set near the top of the seat-tube. The trickiest part here was making sure that the wire had enough play to work well when the front wheel is turned 180° in either direction. I also mounted a small hood over each light to help keep them out of the eyes of nearby cyclists. The hoods are made from that wonderful malleable MSR backpacking stove wind-guard metal. I went for many months with just the hub routed straight into the LEDs. 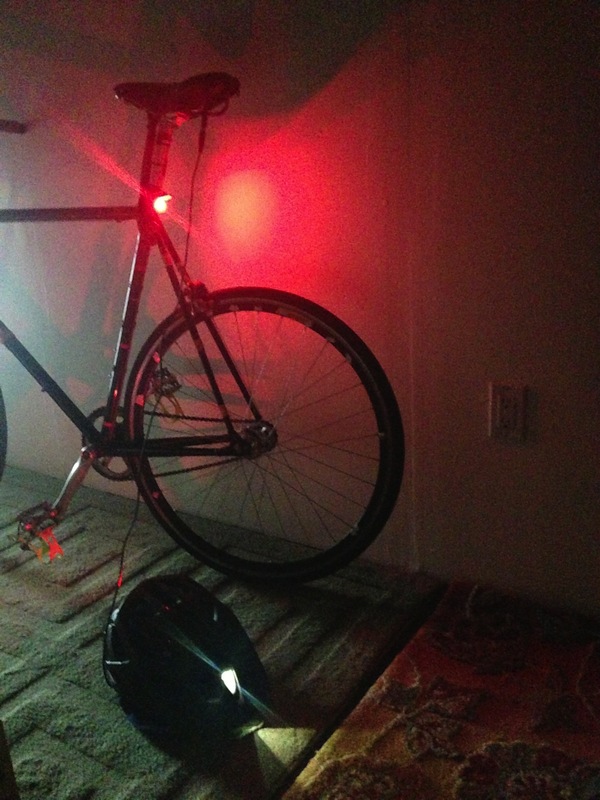 The Luxeon LEDs were super bright: the tail-lights easily competed with the tail-lights of cars. This was fine as a first pass, but because the HUB outputs low-frequency AC (about 20-40Hz), the LEDs flashed annoyingly, and also were only outputting about 50% duty-cycle. Phase 2: rectifying the situation. To alleviate the flashing and I added an off-the-shelf rectifier from Radio Shack. This was a huge improvement: the duty cycle was doubled, and the flashing was greatly diminished. Any loss in brightness due to the extra diodes in the rectifier was negligible. However, at low RPMs there was still some flashing, and of course when I came to a stop the lights would go out. Altho the lights on the bike were super-bright, I felt I would be even more visible to traffic if I had lights on my helmet as well. The challenge here was how to get the power from the bike-frame up to the helmet in an easy, low-profile, and most importantly safe way: if I come-a-cropper, I don't need additional whiplash from my helmet tether! 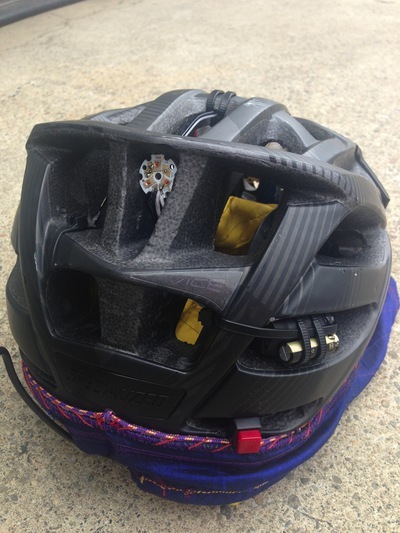 After a lot of thought and research into break-away connectors, I finally decided to just try the simplest thing: standard 1/4-inch audio jacks under the seat and on the helmet, with standard audio 1/4-inch connector wire in-between. The jacks are each mounted very securely, so that I can just yank the wire out without putting strain on the rest of the wiring. This solution has worked great: I use a coiled audio cable which routes from the rear of the helmet, along my chest, and then down to the rear of the seat. The only tricky consideration was making sure that the cable doesn't interfere with free head-movement, so I can look side-to-side freely. The solution here turned out to be to mount the connecting coiled wire onto my backpack straps. Without the end near the helmet being pinned, even with a very long cable there would be drag on the helmet when I looked left or right. It may be my imagination, but I think adding the lights to the helmet really helped make me visible to cars. I noticed immediately that I get a little more berth, and cars at intersections start braking a bit sooner than they used to. Phase 4: embarassing invisibility syndrome. So far so good, but when I come to a stop I turn into the invisible man! This is because there's only juice from the dynamo when it's in motion. I tried a few configurations of resistors and traditional capacitors, and found that if I wanted to get even a couple seconds of feeble glow when stopped, I either had to use so much resistance that the lights were pathetic, or I'd need a capacitor the size of a coffee thermos. I knew Ultra-Capacitors were a thing, but they had inconvenient form-factors, high price-tags, and a bunch of caveats around their use, such as charge balancing, etc. So I gave up for a while. But finally I decided to look at ultra-caps again, and happened upon the Panasonic "Gold Double-Layer" capacitors. I'm not sure if these are technically Ultra-Capacitors, but they're awesome. I tried a few from the "NF" line, with underwhelming results. I looked closer, and realized I should have tried the "HZ" or "HW" lines. So I tried both of those, and ended up settling on the EECHZ0E106 from the HZ line. This cap is rated at 2.5V for 10F. I was estimating that my LEDs wanted about 9V, so I knew I'd need to bump up the voltage of the capacitors by chaining them. This is ordinarily a bummer because putting capacitors in series decreases the overall capacitance, but with 10F to play with, that's not such a big deal. So I put four of them in series for an effective voltage rating of 10V, and an effective capacitance of 2.5F: still a ton of capacitance! (this is assuming the double-layer capacitors combine like traditional idealized caps). The panasonic caps are wonderful. They're very forgiving, and they don't discharge catastophically. They're like little ideal rechargable batteries. From a physical wiring perspective, this is a moderately advanced soldering project. I've thought about putting together kits for this, but all the wiring and mounting is very bespoke. I may try to do my take on a simple front-facing light mounted on the forks. And here's the final circuit diagram. The two switches are just for convenience. SW1 toggles flow from the dynamo itself, and SW2 can be used to switch off discharge from the caps. The extra bonus of having the caps in the helmet w/ a switch is that it's a sort of funky flashlight !